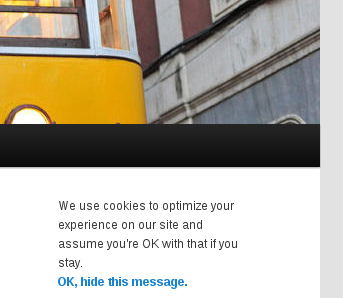 FrankenCookie provides a widget that offers visitors an explanation about cookies being placed on their computer. The widget provides a default text which can be customized. It also provides a button that visitors can click so that the widget does not appear again as long as the FrankenCookie is found when the visitor browses the site. 1. Upload or extract the frankencookie folder to your site’s /wp-content/plugins/directory. You can also use the *Add new* option found in the *Plugins* menu in WordPress. 2. Enable the plugin from the *Plugins* menu in WordPress. 3. Drag the FrankenCookie widget under *Appearance > Widgets* to a sidebar. 4. Customize the widget’s text if you want to. How does this impact my site’s performance? Tests with P3 show that the plugin’s execution time is about 1-2% of WordPress’ core. Well, still a small price to pay compared to the abysmal nonsense of some regulations. The widget can be styled quite easily using CSS rules.